Kiwanis and city are doing battle over the current Casa Loma management contract. With a city-imposed deadline fast approaching, Kiwanis and the city don’t appear to be any closer to a deal regarding the future management of Casa Loma. The mayor, some councillors, and city staff expressed frustration at last month’s council, saying the Kiwanis Club of Casa Loma has not made more progress on its contract obligations to fix up the landmark castle’s interior. L-R: Candidates Thomson, Ford, Smitherman, Pantalone, Achampong and debate moderator David Mitchell. Photo by Kris Scheuer/Town Crier. 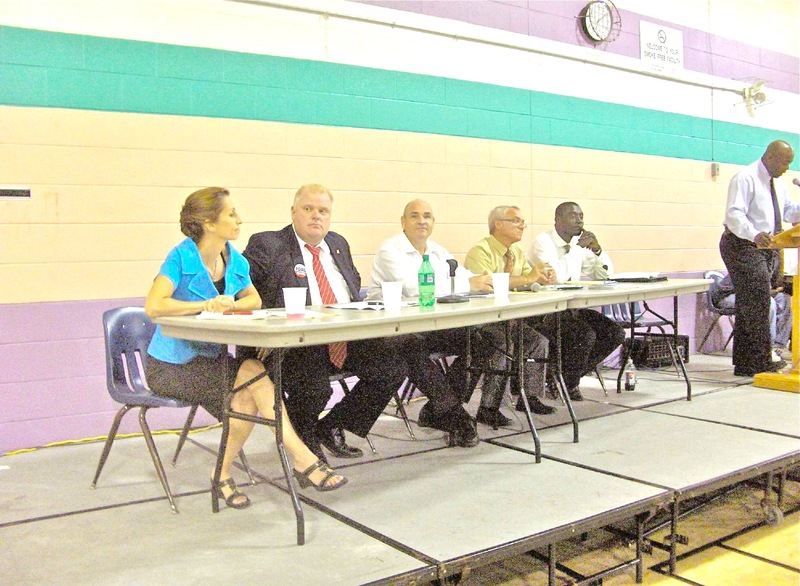 His opposition to plans to redevelop of Lawrence Heights put mayoral candidate Rob Ford in the hot seat at a recent debate held in the neighbourhood. At the July 23 debate, one resident accused Ford of carrying a virtual axe to “kill things” as his campaign symbol. Ford was one of only three councillors who voted against the Lawrence Heights plan July 6 at city council. Ford responded by saying he didn’t support the plan to replace 1,208 rent-geared-to income units to the area and add around 5,000 private homes because he’d heard opposition from among the 4,000 people who he said signed a petition against the project. But he did support helping residents with access to affordable housing. Photo courtesy of ward 13 candidate Jackelyn Van Altenberg. Safety is a matter close to the heart of ward 13 candidate Jackelyn Van Altenberg. She’s been a paramedic with the city for nine years and stresses the need for improvements in everything from Toronto’s roads, housing to nursing homes. Residents (L-R) Burt Rairamo, Gordon Deeks, Linda Deeks and Jesper Thoft among those opposed to current retail development plans at 1860 Bayview. Photo by Francis Crescia/Town Crier. Community celebration over the rejection of an application to build a two-storey retail complex at Bayview and Broadway has been short-lived. The developer, MJB Corporation, is now set to appeal to the Ontario Municipal Board after the city’s committee of adjustment refused an application to redevelop the former Brennan’s Pontiac site at 1860 Bayview Ave.
On July 6, the committee ruled the proposal was not desirable for the area and didn’t meet the city’s official plan or zoning bylaws. “We are disappointed with their decision (to appeal). The city and community’s concerns have been clearly articulated, and the committee of adjustment agrees that the development is not minor in nature,” wrote Wayne Sliberman in an email. Sliberman, a local resident, is part of a working group dealing with the proposal. MJB Corp applied to build a two-floor retail store covering almost 90 percent of the site, along with 220 parking spaces. Currently the site is zoned to allow a structure that would cover one third of the spot and have a minimum of 242 parking spaces. TTC now looking to buy 9 Linnsmore or another property nextdoor as a spot to build second exit for Greenwood subway station. Photo by Kris Scheuer/Town Crier. The TTC has agreed to adopt a community’s proposal for a new exit planned for Greenwood subway station. But there’s one caveat: It could still involve home expropriation. The neighbourhood near Greenwood and Donlands station got up in arms in July after the TTC announced plans to build new exits for both subway stations involved expropriation. The transit commission’s original plan was to buy or expropriate a pair of homes on Strathmore Boulevard including 247, which is owned by Danny and Grace Calia. They have lived there for 51 years, and don’t want to move. After outcry from the family and neighbours, the community presented a new option at a July 12 public meeting. The TTC has now adopted the option as the go-ahead plan: expropriating property on Linnsmore Crescent instead. The emergency exit would be located on Linnsmore across from Greenwood station’s current exit/entrance. Photo courtesy of Albert Castells. Albert Castells wants to apply his fix-it skills to city hall. 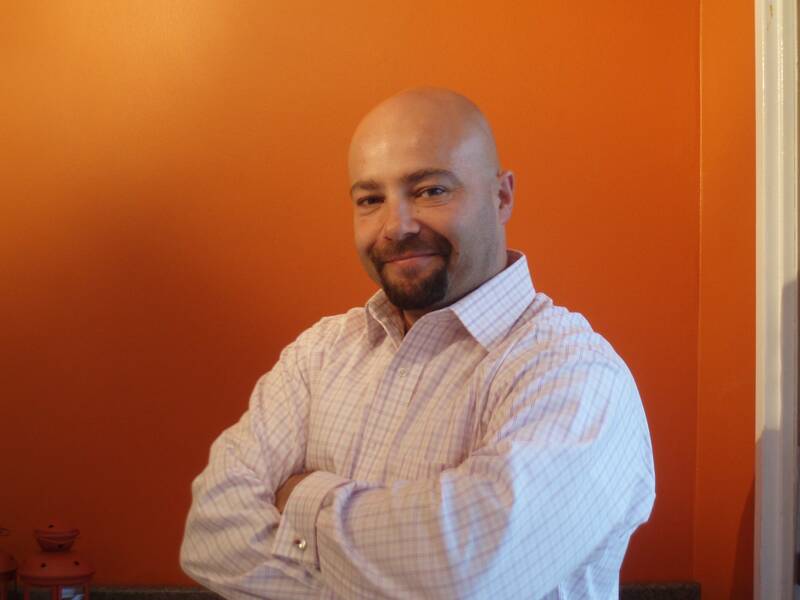 Castells has been a mortgage broker, runs a home renovation business now and wants to be the next councillor for Ward 32. He said Toronto hasn’t been operating the way it should be. “Customer service is number one,” said Castells, adding if elected, he’d treat his constituents as he does his clients. He accuses the current councillor Sandra Bussin of focusing too much on the Beach community and not on other parts of the eastern ward. The city's done millions in external renos, but Kiwanis behind on some of the internal repairs agreed to in current contract. File photo/Town Crier. Kiwanis Club of Casa Loma has until July 31 to fix its relationship with the city or lose its contract to run Toronto’s famous castle. Kiwanis has operated the city-owned castle since 1937, but disputes over the current 20-year management agreement have put that partnership at risk. On July 7, the city voted to give Kiwanis until the end of the month to agree in writing to a series of actions, including developing a financial plan on how the group plans to fulfill its contract obligations to fix up the castle’s interior. The city contends Kiwanis is woefully behind on a commitment to spend $1.6 million fixing the hunting lodge, visitors centre, dining facilities, and flooring.